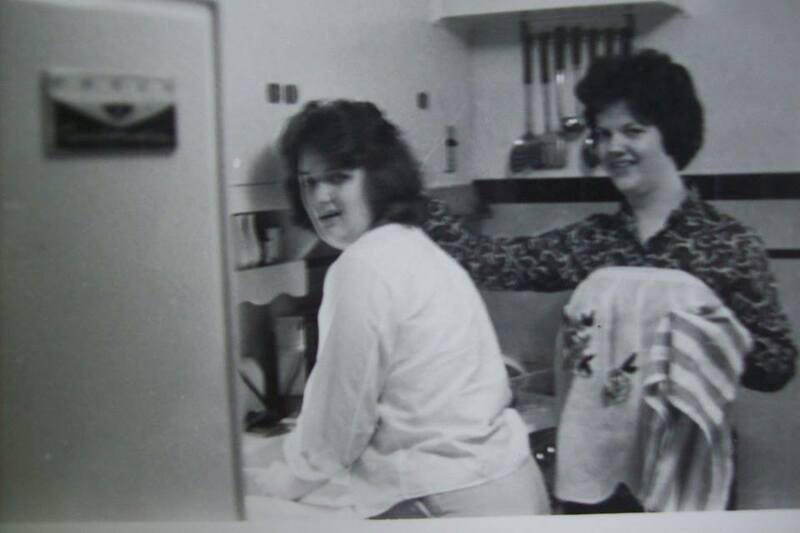 My mom (right) and aunt doing the dishes before I was ever even thought of. Doing the dishes isn’t particularly Appalachian–people wash up after meals everywhere–but it struck me that characters in my books often have great conversations over dish washing. Why is that? Well, probably because I’ve been part of many a washing up chat. Growing up, doing the dishes–especially after a family meal–was part of the event. It was generally a task undertaken by the women in the house, and there was plenty of talk to go with the suds and hot water. Of course, there are pitfalls–forks not quite clean and bowls in the wrong cupboard–put it’s worth it for the fellowship. Here’s a dish washing scene from Appalachian Serenade–my novella–which is still available for free download. That evening Delilah washed the supper dishes while Charlotte dried and put them away. She tried to think of a subtle way to ask after Robert Thornton, but her sister saved her the trouble. Charlotte giggled and covered her mouth. Delilah risked a look at her sister and caught the giggles. They stood in the kitchen laughing like girls and Delilah felt a bit of the pain of the past decade slide from her shoulders. Maybe she did have a future. Maybe she could find another husband—a good one—and start a family. Maybe it wasn’t too late after all. Love this! That scene and others like it gave MiaDS such an authentic feel. The picture could easily be of my mother and one of my aunts. I wrote a scene in an unpublished story that takes place as two sisters clean up after the family’s Sunday lunch. I have so many memories of my aunts and my mom cleaning up after Grandma’s meals. Something changed with my generation, though. Perhaps it is just that we all live so far apart, or time is just used differently in our culture. I miss the fact that I will not make the same memories with my brothers’ wives. Thank you for capturing it! I love this picture of your Mother.